I have put up several posts about freezer to crockpot meals and how to put up a month or more worth of meals at once. I have gotten a lot of questions about the right type of bags, and any other equipment that is needed. The truth is, you don't need a whole lot, but the 7 items below come in pretty handy when freezing meals for use later, whether you do freezer to crockpot or just pre-made frozen meals. Ziploc Freezer Quart Bags – There are lots of freezer bags on the market but the Ziploc brand is the best known and many freezer cooks swear by them. Quart bags are great for single or double servings of soups or to use in freezer kits like taco fixings and pizza toppings. Ziploc Freezer Gallon Bags – Gallon bags will likely get the most workout in your freezer cooking routine. Everything from soups, stews, to slow cooker casseroles can go into these bags. Stock up! Pyrex 2 Cup Measuring Cup – Have a good measuring cup is essential for dump and go freezer meals. Pyrex’s cup has metric and US measurements. Consider getting 2; one to use for wet ingredients and one for dry while you’re cooking. Freezer Labels – Lots of freezer bags have a space that you can write what’s in the bag, but if you reuse your bags this gets difficult. These freezer labels stick easily to aluminum foil, freezer wrap, plastic or glass. Peel them off when you’re done or place a new label over the top to reuse them. Slow Cooker Liners – Many freezer meals are cooked in the slow cooker. These liners are amazing! Once your meal is done just pick them up from the slow cooker and throw them away. Nothing left to clean! They work especially well for sticky (cheese) and messy (anything with BBQ sauce etc) foods. Pre cut Square Wax Paper – it’s no fun when everything sticks together. These precut wax paper squares will speed up your prep time in the kitchen and keep things like pre-formed hamburgers, pancakes, and waffles from sticking together after they freeze. Casserole Pan- You can use disposable aluminum pans but if you are worried about the taste or how they will hold up investing in a few good quality freezer to oven pans makes sense. The Marinex brand can go from the freezer to a 212F or less oven while preheating. You can of course thaw casseroles ahead of time and put the warmer (not frozen) pan directly into the oven. 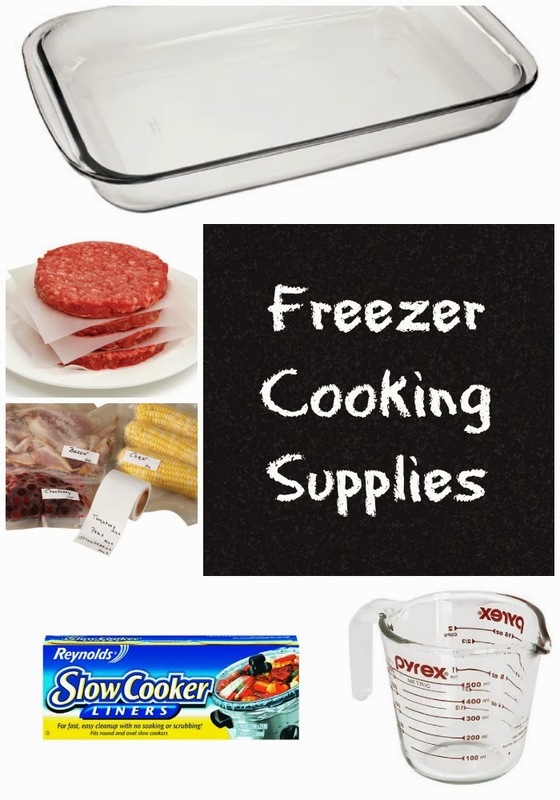 Do you have any go to supplies for freezer cooking? You wouldn't believe how many freezer bags I go through. I use them ALL the time! They're so useful and I keep them in gallon and quart sizes. I'll have to check into the freezer to oven pans for casseroles. I've been trying to cook in larger batches lately. Thanks for the tips! We use so many ziploc bags it isn't funny! I need to buy freezer bags, I always use normal bags and get freezer burn! I don't know what I would do without freezer bags and wax paper!!! Makes LIFE So much easier!! Slow cooker liner are one of my must-have kitchen supplies. Since I HATE coming home to cook the freezer idea is such a good one but I admit I've never done it. I seriously need to look into it because I don't know where to start. I'm not sure what can and can't be frozen. These sound like a great ideas. I use my slow cooker quite often and really appreciate the liners to make clean up such a cinch! How come no one told me they made liners for your slow cooker! These are definitely staples in my house. A couple of the things I use the most are my 9x13 Denby pan (they're quite pricey but they clean up crazy easy!) and Reynold's Non-Stick Aluminum foil. LOVE that stuff. Slow cooker liners are a must have for me! Makes clean up so easy!